This is the sister restaurant to the other Machu Picchu, which we’ve already posted about. In fact, it’s right across the street! This is much more of a sit down restaurant, and the price reflects it, but the food is definitely worth it. Everything we had is delicious. So heading into another restaurant called Machu Picchu only steps from the restaurant of the same name we visited a few months back had me a bit confused. Was there some ancient rivalry between the two eatery brewing in Union square unbeknownst to me? A rivalry so old it could rival the rivalry of the Hatfields and McCoys! No, it’s just a sister restaurant plain and simple. They serve the food not served at the other joint with only a few overlapping offerings. I realized this as soon as they handed us the familiar leather bound menus imprinted with their logo. These menus had made an impression on me the first time we were at the other Machu Picchu so seeing them again instantly clued me into what the deal here was. The Machu Picchu we went to before was a char-grilling joint where you can get your hands on some delicious chicken, beef, gizzards, or what have you while this one serves more traditional South American homestyle cuisine. The one thing they do have in common though is their delicious sauces served with pretty much anything you order. I don’t know what any of them were but they’re always bright in color and bold in flavor. Mostly they serve to spice up an already spicy dish. 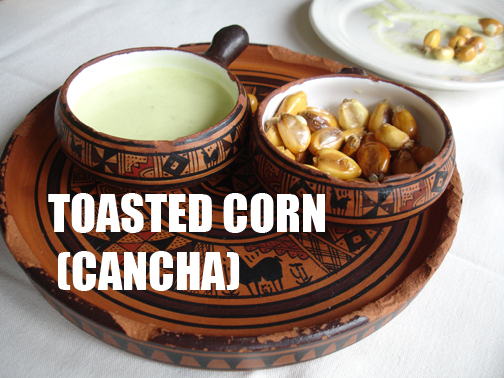 For example, at this restaurant instead of serving bread before the meal they brought out a bowl of toasted corn or cancha served with this delicious spicy sauce. The toasted corn by itself reminded me a lot of corn nuts or really dry unsweetened POPs, but when you get em all sauced up the combination of flavors takes something otherwise dry and bland and turns it into something flavorful and filling. They bring you just enough of the toasted corn to keep you occupied before your food arrives. 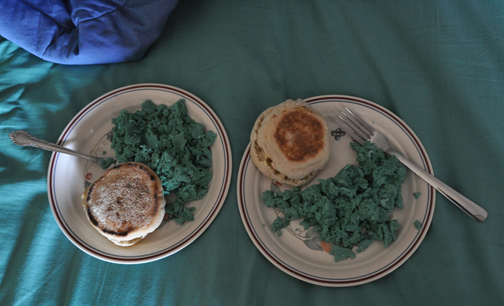 We ordered a lot of food for just the two of us, but we were both might hungry. 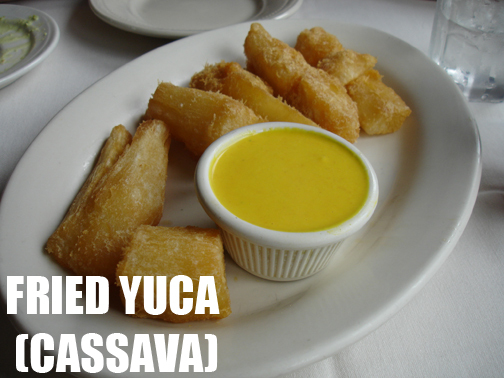 We started with some of the tasty fried yuca or cassava. Again this is served with a very delectable sauce that accompanies the yuca very nicely. It works to both compliment and improve upon both the taste and texture of the yuca. It was so lightly fried that the yuca itself did not lose anything consistency wise. The sauce was a bright yellow color and could be mistaken for mustard but trust me it’s not anything like mustard. The edible part of the yuca, for those not familiar with it, is a root. I had heard of yuca and cassava before but wasn’t really sure what it was. It’s a good thing I had Ché there to fill me in. For me it was a lot like eating a potato. It was starchy and grainy but the consistency wasn’t distracting. The experience was a lot like eating one of the most satisfying french fries I’ve ever eaten. After years of near depressingly bad french fries in my college cafeteria this redeemed the french fry for me. I had almost made the jump to onion rings exclusively (not really though). So all you fans of really good fried potatoes out there should jump on the chance to try this fried yuca, for it is wicked tasty! Next up we got our Carapulca. It had chuño, the ancient Incan freeze dried potatoes we were in search of. Though when it was brought to us we could barely tell what was potato and what was something else. It was a lot like a chicken stew with a lot of potato in it. Don’t get me wrong it was really delicious, but when your looking for unusual food such as freeze dried potatoes it’s always weird to find that its only a small part of a greater dish. We assumed it might be something like a stew served over one of these whole potatoes but the potato itself was very finely diced into the stew itself and kind of held it all together. For being in a stew the potatoes still held their firmness. Unlike when you stew regular potatoes they usually get all mushy. I think they use these freeze dried potatoes rather than any other kind in an effort to thicken the stew since they don’t go all soft. The serving of carapulca was very generous in fact there was plenty for both Ché and I to share. They even serve it with a side of rice. So if your a stew fan go for it and don’t forget to bring your appetite. 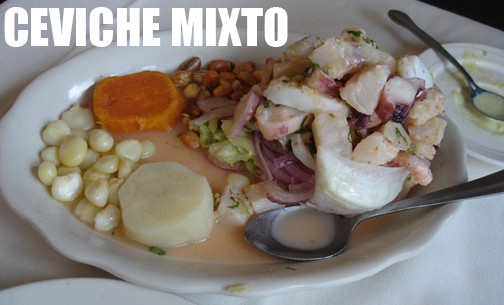 Lastly we finally got a traditional form of Peruvian mixed ceviche. I’ve encountered it at other places but I’ve never seen it anywhere else served in such a heaping helping. Served in a lettuce leaf over some chopped onion we got shrimp, scallops, octopus, squid, clams, and some white fish. In ceviche the seafood is presented raw then marinated in citrus juice usually consisting of lemon and lime juices. The acids serve to cook the sea food until it is edible while still technically being raw. The combination of the cold seafood and the citrus juices presents you with an extremely fresh tasting dish. Obviously this is a dish for seafood lovers. This isn’t something you’d try if you were looking to get into eating seafood. I have friends who have a hard enough time with sushi. One look at this and they would probably walk out of the restaurant Again don’t get me wrong ceviche is amazingly delicious. They serve it here with some of their freakishly giant corn and wedges of both yam and potato. The plate is simply packed with many tasty options there to fill you up and totally satisfy your craving for super fresh seafood. There’s also the Leche de Tigre for those so inclined. If you love the fresh taste of the civiche so much you can order an entire glass of the lemon/lime fish/shellfish marinade juice to drink. Even if you don’t it’s just badass to tell someone your drinking tiger milk. “Pre-packaged Meat Department” by Anthony Albright. It is protected by the Attribution-ShareAlike 2.0 Generic License. Americans don’t know how people ate two hundred years ago, not really. We can imagine it, prepare little historical reenactments, but, in this country, it’s usual a dim taste-alike to what actually was. Agro-business and meat preservation has changed food as radically as the invention of farming. Before these, food could not be molded into the usual forms of commodification. After, it became just another product, with people just as separated from the source of their food as they are from the source of the electricity running through their computers. Ceviche, is not a food that can be branded. It must be fresh. For a self-serve food to be associated with a company, or at least appear in a supermarket, it must be able to sit inert for long periods of time. Meat products were the last hold-outs to this phenomenon. As Roger Horowitz describes it in Putting Meat on the American Table, the reason that meat presented such a problem was because of “the perishable nature of meat products and the dilemma of organizing mass production around an item that came in irregular sizes.” Horowitz goes on to describe how American industry rose to the challenge, first by packaging and branding easily cured pork products, such as bacon and ham. What followed was changing beef from sides to individual cuts, something allowed by packaging, and moving chicken from a small farmer’s product to a completely industrially owned monstrosity. The United States became known to immigrants as that place where you could eat meat every day, something I’ve talked about in other posts. This has created an insatiable market for meat. Meat preservation has allowed for product to endlessly fall into this bottomless pit. 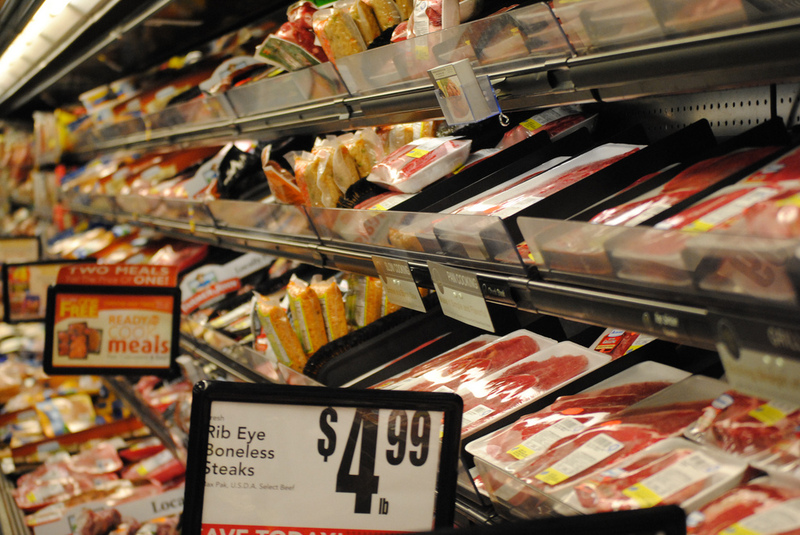 Without it, meat would spoil too quickly to make sense as a shelf-ready product. After preservation, every other type of adulteration, from growth hormones, to antibiotics, to cow cannibalism, becomes not only possible but profitable. Of course, in doing so, meat processing gives no thought to the harmful environmental or personal effects. This account does ignore one thing, being that people as individuals preserved their own meat for centuries before. Horowitz gives equal space to these processes. Where it differs is how meat and animals were used. Chickens used to be kept solely for eggs and cows for their milk. Pigs were kept mainly for meat, but they were the animals most suited to preservation. People mainly ate beef in the winter, and only on special occasions, and chicken in the spring, when the mostly useless young roosters would be slaughtered. Other animals, who were much hardier, such as goats and pigeons, shared table space with these now standard meats. The difference in these old forms of preservation and renewal is that they were sustainable. 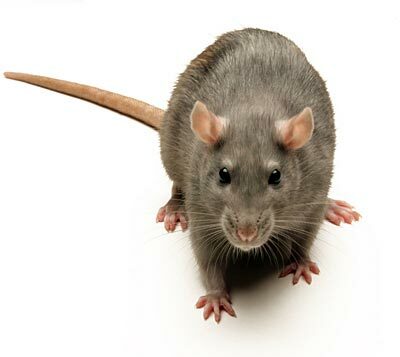 They were also closer to home, meaning the people who raised these animals knew exactly what was going into them. Although it is tempting, we cannot view these changes as cultural and not systematic. There have been changes to the meat industry caused by public outcry, most famously, after Upton Sinclair’s the Jungle, and the various cancer causing additives and hormones attacked in the fifties and sixties. 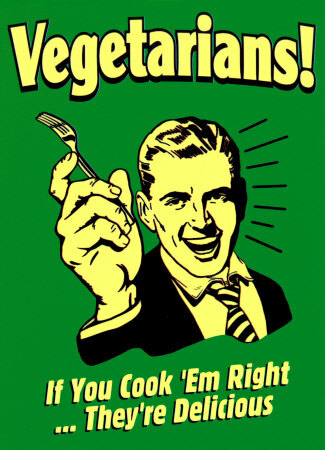 Still, despite the fears and knowledge of the dangers of meat, consumers demand more of it. The meat industry responds by shrugging its shoulders. They say “See, we’re only giving the public what they want.” However, the public only wants this meat because they have debased it to make it affordable. If they were required to make it more healthy, the public not only would need less, but want less of it. Similarly, if the meat industry had to stop abusing the people who worked for it, as described in grim detail in Eric Schlosser’s Fast Food Nation, the prices would go up, and people would once again eat less meat. This has nothing to do with a lack of education (something I discussed a couple of posts ago), but a lack of democracy. The public cannot stop the meat industry, so they do not, and continue to eat meat, because it is affordable and culturally valuable. The chuño is the perfect example of how production itself is not responsible for abuses of power, but a system that would allow them to continue. 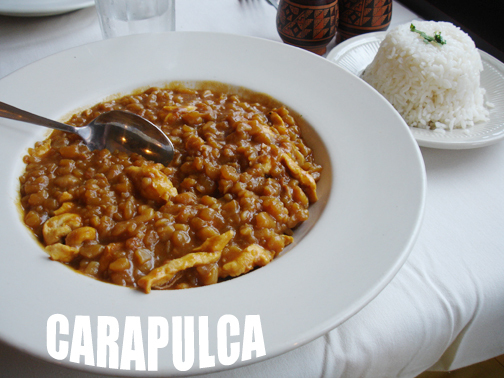 The meal that we ate at Machu Picchu included carapulca, one of the most ancient dishes from Peru, whose substance mainly comes from these preserved potatoes. The history of the chuño has a sad history. A way of preserving potatoes to eat year round, it has existed as part of the Peruvian diet for centuries. However, when the Spanish arrived, as described by Elizabeth Johnston, the food was used by these conquerors as a form of starvation ration for the native people who worked their silver mines. Nothing about the fact that this food was democratically produced for centuries stopped the Spanish from using it to oppress the native population. Similarly, health can only be improved in the United States by a systematic change in how food and all culture is produced. Buying organic, buying free trade, or buying itself, cannot change that. Boston Gastronauts Video Blog Episode 2!! All illustrations and pictures by Andrew Abbott unless otherwise noted. Unfortunately, the Boston Gastronauts have never visited this restaurant. However, we did get delivery twice, and we have no complaints about their delivery service. We’ve only ever ordered the Sub Danger-Zone Subs, which are delicious, and which we talk about in greater detail below. So this week our return to the gastornautical world brought us full circle back to our first encounter with the Fat Sandwich. No I’m not talking about lard spread thick between two pieces of bread, although we have encountered something similar when we were at Cafe Poloina a while back. Fat sandwiches aren’t any ordinary sandwiches. These sandwiches are generally filled with stuff that isn’t normally seen between two pieces of bread (or garlic bread for that matter). 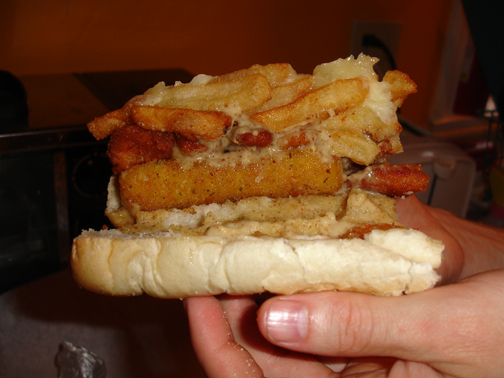 The two things showing up most frequently on these sandwiches are french fries and mozzarella sticks. So if you were that kid at the lunch table in school stuffing potato chips into your peanut butter and jelly sandwich this place is for you. They have a whole section of their menu titled the “sub danger zone” where you feel a whole buyer beware vibe while reading your choices. 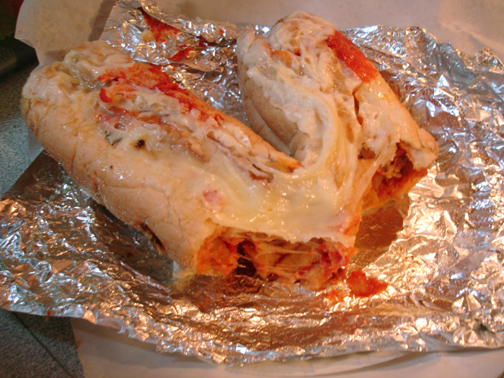 It’s almost like being on death row and choosing your last meal except that it all comes stuffed in a hoagie roll. They even have “vegetarian” options though seeing that everything still comes fried on the sub I can’t imagine they’re that much better for you then anything else in the danger zone. This time around I got the Fat Willard sub. I don’t exactly know who it’s named after, but I was hoping it wasn’t a reference to the movie Willard. In that case the chicken on my sandwich wasn’t chicken it was more likely “chicken”… Anyways the sub was loaded with fried chicken, french fries, mozzarella sticks, marinara sauce, Parmesan and mozzarella cheese all on garlic bread. These things are monsterous let me tell you. I made the mistake of ordering a large. 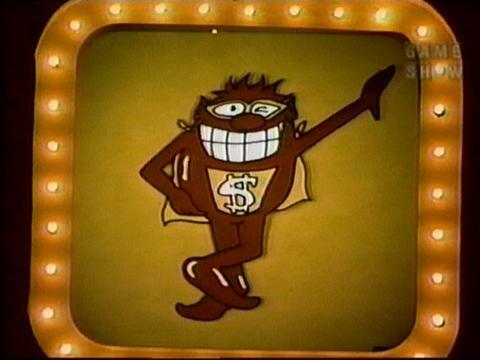 The difference between a small and large is only a dollar and size wise its nearly indistinguishable so a word to the wise is not to press your luck and go with a small. I think I’ve run into this problem before. I did indeed get a little bit sick after eating the entire thing, but I feel it was the overload of fried foods entering my system after not having eaten anything so heavily fried in a while. 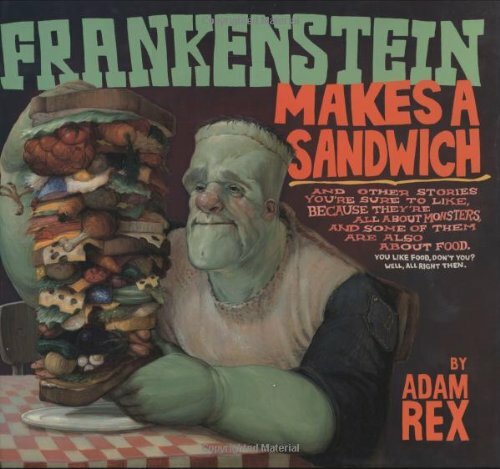 I have had one of these sandwiches on three separate occasions and this is the only time I really felt it after eating. Each time I had a different sandwich but every time they were absolutely delicious. I’ve also had run ins with the Fat Dog sub being comprised of about six hotdogs , pepperoni, mozzarella sticks, french fries, marinara sauce, and melted cheese and the Fat Bull which had steak, mozzarella sticks, french fries, and melted cheese. The actual problem with these bad Larrys is you can’t really leave any left overs cause they most likely wouldn’t re-heat very well. The one thing about these subs that bothers me though is everything just tends to blend together by the end into one big cheesy/saucy/fried mass. Sometimes you might not even taste any meat on the sandwich if theres too much of one thing or another. I feel like putting these things together must be somewhere between an art form and an exact science. Then again if your willing to ingest something called a “fat sandwich” I don’t think your necessarily concerned with distinguishing the flavor of everything in the sandwich. These things are built for a purpose and that purpose is to fill an empty stomach, and then some. So if you’re starvin’ like Marvin, and you’re in the area I definitely recommend giving the First Bite Cafe a try, and if you’re gonna’ try for the Sub Danger Zone make sure you fast for a few days before hand! For a second, whenever Andrew and I talk about a fat sandwich, in my head I see lard in between two pieces of bread. That would be gross. 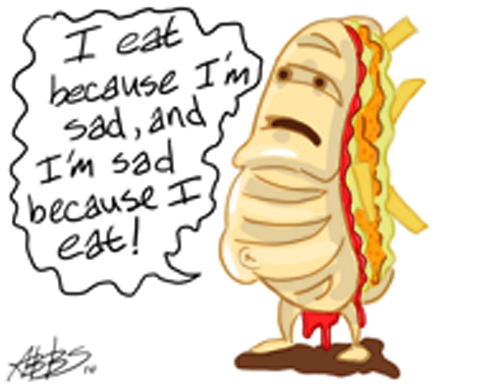 Of course, some people react the same way to the fat sandwiches that we actually ate. Why don’t I? Or for that matter, why does the Double Down gross me out more than a sandwich with fries on it? Simply, First Bite’s fat sandwiches are honest, in the way that the Double Down is not. It’s American over-consumption as a celebration, instead of as an addiction. And let’s be honest here, every person in the United States is either addicted to brutally unhealthy food, or to dieting. Sometimes a person will swing wildly from one to the other. The more important factor affecting the health of the United States is obesity. According to the Weight-control Information Network, an organization run by the National Institutes of Health, 1 in 3 people in the United States is obese. The causes for this are multi-faceted and complicated, but it is possible, in general to point to more processed food. This is how America’s upside down relationship with food has developed. The real wages of the United States have remained at a constant low lull for the past twenty-five years, compared with their meteoric rise in the mid-seventies. Early in his book The Paradox of Plenty, Harvey Levenstein makes research backed point that “the best way to improve the diets of the poor was simply to put more money in their pocket.” Because the subsidized food programs in the United States, from WIC to School Lunch, rely heavily on processed foods, and wages have not improved, the diets of the poor and middle income people of the United States have steadily worsened, which we see in the consistent rise of obesity. No amount of nutrition awareness will change that. Yet there has been an increase in nutritional information. Nutrition facts labels are the one way that this new consciousness actually helps a consumer. In a perfect world, somebody would walk into a store, compare the labels of similar products, and then walk out, beaming with capitalist joy at their healthful purchase. In the corporate–controlled, semi–dystopian world we live in, this kind of thing would only happen in the commercial for a health food store. Instead, the ideas of nutritional eating are instead used by food companies to sell you their products, no matter how unhealthy they might be. This is my beef (chicken?) with the Double Down. Other than the fact that it made me feel like I wanted to die, the (sort-of) sandwich attempts to make apologies for its obvious heart-attack causing properties. It comes in a “healthier” grilled chicken version, which while lower in fat, is higher in sodium. What really takes the F***ed-Up Award, though, is that a lot of the debate around this sandwich is whether or not its low carb, something KFC plays up in their “So much chicken, there wasn’t room for a bun” tag line. 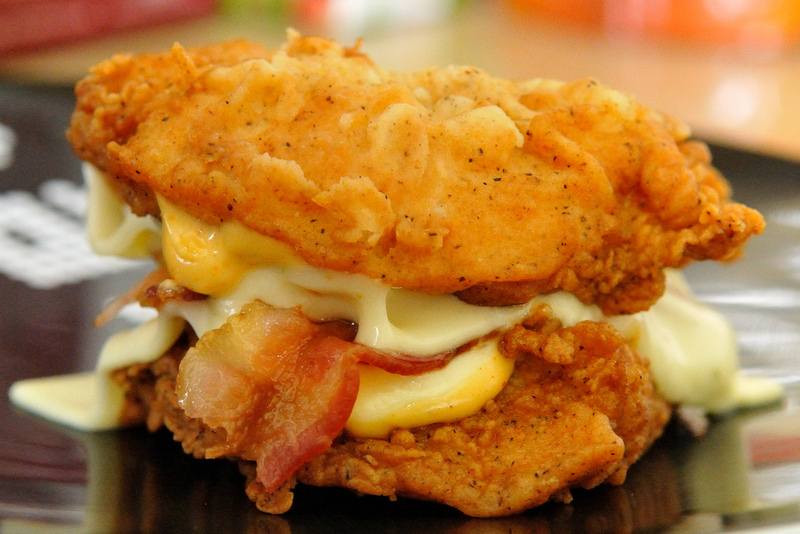 When somebody asks “Can the Double Down be considered a low carb food?” what they’re really asking is “Can there exist a universe where two pieces of fried chicken cemented together with cheese and bacon be healthy for you?” The reason they don’t ask the second question is because any thinking person nearby would slap them. The reason that the Fat Sandwiches from First Bite don’t offend me is because you know exactly what you’re getting. There’s no low carb debate. There’s no lip service to healthier options. The part of the menu that the Fat Sandwiches appear on is called the Sub Danger Zone. The reason you eat these sandwiches is that you want to eat them, with no apologies for how healthy they are. 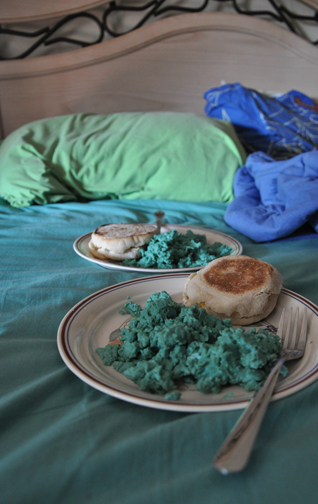 It also ensures that you know that they’re an occasional food. KFC does not want to make the Double Down an occasional food, because that would cut into the enormous profits that the sandwich is making. Remember, this sandwich was only supposed to be around until May 23rd. After it sold over 10 million, KFC decided to extend its run. This is fast food reduced to its most destructive form. Not only does it make sure that the people that work there have poor health because of the wages they pay, but it also makes sure other people making poor wages have equally poor health. That’s what I mean when I talk about fast food as an addiction. It’s having a pusher, for their own benefit, tell you every reason to do something that’s unhealthy for you, and doing it, because you do not have any other choice. One situation is biological and one is economic. The net result is the same.